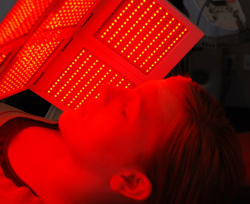 PINK SANDS SPA is proud to make available the LED LIGHTWAVE™ system and treatments! LED LIGHTWAVE™ is a safe, sound, non-invasive yet sophisticated skin rejuvenation treatment program which has been clinically proven to achieve clearer and healthier skin. 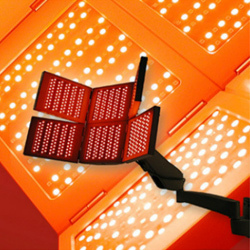 LED LIGHTWAVE™ utilizes combinations of three colors of light with unique, narrow band wavelengths to enhance skin condition and treatment of a variety of skin disorders. 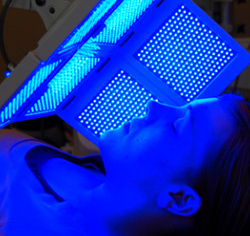 LED LIGHTWAVE™ therapy performs deep on the cellular level to bring about alluring and healthy-looking skin. After a series of sessions, a reduction of wrinkles, acne, pigmentation and fine lines will noticeably produce the look of resplendent and younger-looking skin. LIGHTWAVE has received 5 FDA clearances. Skin Types - Appropriate for all skin types including sensitive skin. Description: This treatment reduces and even reverses the appearance of aging and damaged skin. A series of LED light therapy treatments results in significant cosmetic enhancement and provides valuable benefits to reduce acne, scarring, and pigment problems. Number of Suggested Treatments: An initial ten treatment series is recommended for this protocol over an 8-12 week period. Clients should receive LED light therapy treatments two-three times a week for the first 4-5 weeks with at least 36 hours between treatment sessions. The 10th treatment session should occur on week 8-12 depending on the intensity and amount of exfoliation that occurred throughout the series of treatments. Less exfoliation will require waiting up to 12 weeks between the first session and tenth session, allowing the body’s new healthy skin cells to reach the skin’s surface. Maintenance treatments once every 6-8 weeks, or as needed, can prolong the youthful appearance. Description: This treatment uses a combination of proven peptides, hyaluronic acid, vitamin c, and collagen to re-hydrate the face. The treatment aids in decreasing flaccidity, lifting sagging tissues, restoring skin tone, brightens, reduction of fine lines, removes years of sun damage, diminishes wrinkles, and texture resulting in an overall improvement erasing years from the face. If you demand the best, then Topical Light Infusion is for you. Number of Suggested Treatments: Anti Aging With Topical Infusion - Eight treatments are recommended. Maintenance once every 6 weeks, or as needed, can improve a youthful appearance. Skin Types - Recommended for most skin types. Description: This is an effective anti-aging facial. It incorporates a light exfoliation scrub with an LED light therapy treatment and finishing mask. Increases cellular turnover and promotes collagen and elastin formation. Promotes the growth of healthier skin. Improves the overall skin tone, texture and appearance. Provides hydration, protection while increasing moisture. Description: This facial is an effective treatment for removing dead, dull skin and for stimulating elastin for skin tightening. It incorporates a medium peel with an LED light therapy treatment. Skin Types - Recommended for mild to moderate acne prone skin types. Description: This facial is effective at reducing the P.acnes bacteria as well as pronounced skin inflammation and redness commonly associated with acne breakouts. This facial includes everything a teen facial includes but also utilizes 15 minutes of blue light and 15 minutes of red light to significantly help decrease acne and reduce inflammation and redness. Reduces skin congestion and minimizes oil production. Provides gentle yet effective exfoliation allowing for better photon penetration. Number of Suggested Treatments: An initial nine treatment series is recommended for this protocol over an 8-week period. Treatments should best occur two times a week for the first 4 weeks with at least 36 hours between treatment sessions. The 9th treatment session should occur on week 8. Before, during, and after photos should be taken, at a minimum, on week one, week four (which is by when the majority of clients see the largest and most significant improvement in their skin) and week eight, documenting the progress. On average, 80% of clients see a 75% reduction in the number of inflammatory acne lesions with results lasting from 3-6 months. Description: This treatment addresses issues with symptoms of persistent and chronic discomfort and inflammation. Soft-tissue injuries found in the shoulders, knees, back and small joint areas, as well as other prolonged and continuing ailments, typically see a decrease in discomfort approximately one - two hours after exposure. Number of Suggested Treatments: In general, an initial minimum treatment series of six is recommended over a one to two week period in order to stimulate a noticeable response from the body at a cellular level. 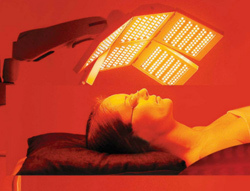 LED light therapy treatments should continue two-three times a week with at least 24-36 hours between treatment sessions. The actual number of treatment sessions will depend greatly upon the condition being treated and the extent or severity of the condition. to increase water intake by at least 8 ounces. * 24-hour notice is required for cancellations. A credit card is required to hold an appointment. If you fail to make your appointment, your credit card will be charged. We appreciate your thoughtfulness and cooperation regarding your visit. Gratuities are accepted as cash or on credit cards. All sales are final. © Copyright 2012 Pink Sands. All rights reserved. Designed by Integrity Webworks.